Driving force behind West Coast Guitar Night shows serious chops as a recording artist and producer, too. Seasickness is not generally an occupational hazard performers have to face, unless they are cruise-ship minions or lucky enough to own their own yacht. Les Finnigan is neither, but the guitarist did have to learn to deal with aquatic queasiness this year, as part of an unusual summertime job: in-house entertainer on BC Ferries' Tsawwassen--Swartz Bay run. "It did take a little while to get used to, because I usually stand up when I play," the amiable musician admits, on the line from his Lower Mainland home. "The first couple of times I had the sea-legs feeling when I was going home. Usually when you're on the boat you can lean up against a railing or something, but I was playing guitar and wobbling back and forth all over the place." The other annoyances of ferry travel--wailing babies, chattering tourists, boiled-sock cafeteria smells--didn't faze Finnigan at all, in part because he served his professional apprenticeship as a street musician. "I know some other artists demand utter silence, but I'm not that picky," he says. "I'm used to playing with endless amounts of distraction. From playing Granville Island so often, I'm completely used to cars and birds and children." What does unhinge him, however is quiet; or, at least, the kind of polite and attentive hush that he's starting to generate at his increasingly frequent soft-seater concerts. "Sometimes when I'm doing a show like that I find the silence kind of spooky," he admits. 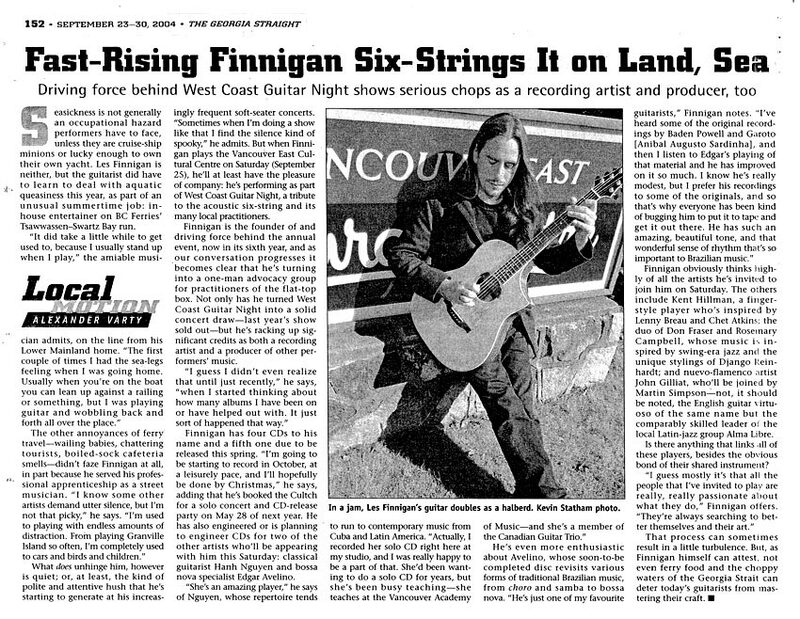 But when Finnigan plays the Vancouver East Cultural Centre on Saturday (September 25), he'll at least have the pleasure of company: he's performing as part of West Coast Guitar Night, a tribute to the acoustic six-string and its many local practitioners. Finnigan is the founder of and driving force behind the annual event, now in its sixth year, and as our conversation progresses it becomes clear that he's turning into a one-man advocacy group for practitioners of the flat-top box. Not only has he turned West Coast Guitar Night into a solid concert draw--last year's show sold out--but he's racking up significant credits as both a recording artist and a producer of other performers' music. "I guess I didn't even realize that until just recently," he says, "when I started thinking about how many albums I have been on or have helped out with. It just sort of happened that way." Finnigan has four CDs to his name and a fifth one due to be released this spring. "I'm going to be starting to record in October, at a leisurely pace, and I'll hopefully be done by Christmas," he says, adding that he's booked the Cultch for a solo concert and CD-release party on May 28 of next year. He has also engineered or is planning to engineer CDs for two of the other artists who'll be appearing with him this Saturday: classical guitarist Hanh Nguyen and bossa nova specialist Edgar Avelino. "She's an amazing player," he says of Nguyen, whose repertoire tends to run to contemporary music from Cuba and Latin America. "Actually, I recorded her solo CD right here at my studio, and I was really happy to be a part of that. She'd been wanting to do a solo CD for years, but she's been busy teaching--she teaches at the Vancouver Academy of Music--and she's a member of the Canadian Guitar Trio." He's even more enthusiastic about Avelino, whose soon-to-be completed disc revisits various forms of traditional Brazilian music, from choro and samba to bossa nova. "He's just one of my favourite guitarists," Finnigan notes. "I've heard some of the original recordings by Baden Powell and Garoto [Anibal Augusto Sardinha], and then I listen to Edgar's playing of that material and he has improved on it so much. I know he's really modest, but I prefer his recordings to some of the originals, and so that's why everyone has been kind of bugging him to put it to tape and get it out there. He has such an amazing, beautiful tone, and that wonderful sense of rhythm that's so important to Brazilian music." Finnigan obviously thinks highly of all the artists he's invited to join him on Saturday. The others include Kent Hillman, a fingerstyle player who's inspired by Lenny Breau and Chet Atkins; the duo of Don Fraser and Rosemary Campbell, whose music is inspired by swing-era jazz and the unique stylings of Django Reinhardt; and nuevo-flamenco artist John Gilliat, who'll be joined by Martin Simpson--not, it should be noted, the English guitar virtuoso of the same name but the comparably skilled leader of the local Latin-jazz group Alma Libre. Is there anything that links all of these players, besides the obvious bond of their shared instrument? "I guess mostly it's that all the people that I've invited to play are really, really passionate about what they do," Finnigan offers. "They're always searching to better themselves and their art." That process can sometimes result in a little turbulence. But, as Finnigan himself can attest, not even ferry food and the choppy waters of the Georgia Strait can deter today's guitarists from mastering their craft.